Law enforcement officers from the Solano County Sheriff’s Office, California Highway Patrol and Vacaville Police Department will come together with community members to discuss community issues, build relationships and drink coffee Feb. 8. All community members are invited. The event is from 8:30 to 10 a.m. at Journey Coffee Company, 896B Alamo Drive. Coffee with a Cop provides an opportunity for community members to ask questions and learn more about the work of the various departments in Vacaville’s neighborhoods. The majority of contacts law enforcement officials have with the public happen during emergencies, or emotional situations, according to a press release for the event. Such situations are not always the most effective times to build relationships with the community. Some community members may feel that officers are unapproachable on the street, the release said. 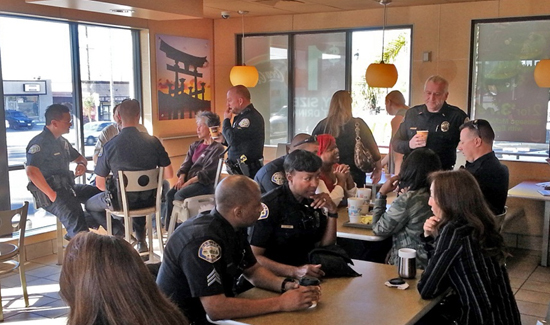 Coffee with a Cop aims to breaks down barriers and allows for a relaxed, one-on-one interaction. Coffee with a Cop is a national initiative supported by the U.S. Department of Justice, Office of Community Oriented Policing Services. Ed. note: The COPS Office has been closed by President Trump so if agencies want to continue to do these events they’ll have to figure out a way to pay for it on their own.